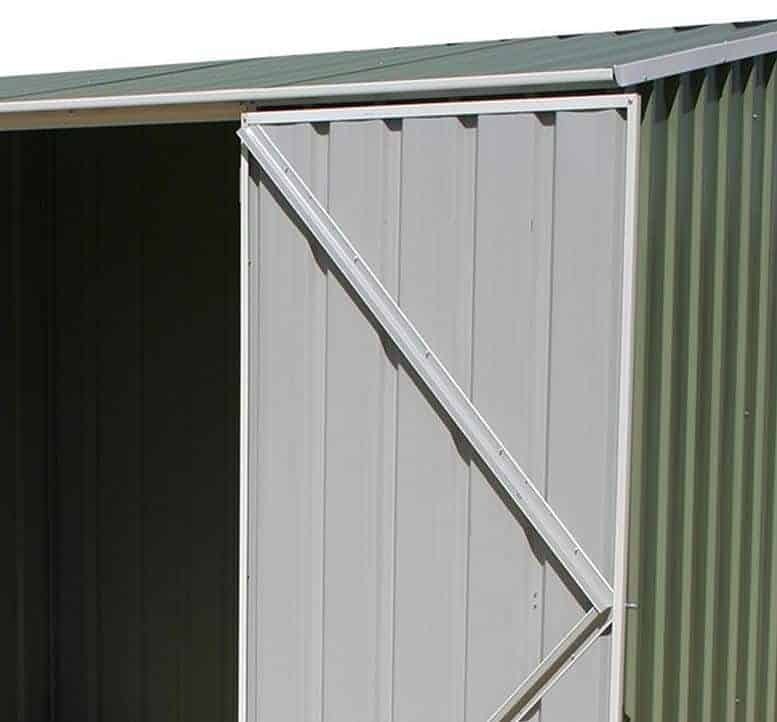 This solid looking and feeling metal storage shed is designed to keep your contents safe from both the elements and intruders. Although a padlock isn’t included, which we would have liked, the pad bolt shutting system is padlock ready. The rugged, yet no unattractive, corrugated appearance and the lack of windows are also enough to make many opportune thieves pass by and seek out an easier target. One thing that really stood out about this shed is that it offers excellent rain and snow resistance, which is always important in the unpredictable UK climate. The pent roof provides an effective first line of defence, which is then ably assisted by the superior quality steel cladding. It’s thanks to these two elements that the manufacturer has been able to give a 20 year warranty against rust damage that results in perforations. Another feature that we find very welcome is its tall eaves height. This means you can fit more inside that you might think at first glance, particularly as the braced and hinged door gives a large opening with which to manoeuvre items in and out. With a full assembly kit included, your tough new shed will be assembled and ready to use in as little as four hours. 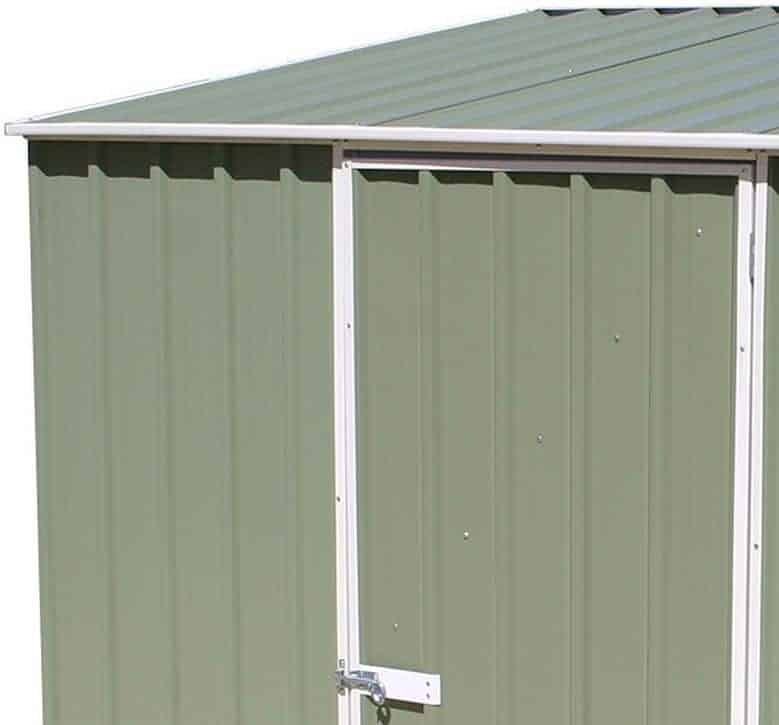 This pent roofed space saving storage shed has proved a big hit in Australia, where the manufacturer’s are a leading name in garden buildings, and it should prove just as useful here in the United Kingdom. 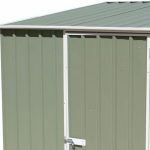 It has a classic metal shed design, with corrugated cladding and a skillion roof, yet the pale eucalyptus green paintwork softens its overall appearance. Nevertheless, we feel that it still looks tough enough to dissuade many potential thieves from attempting to break into it. When we review pent roofed metal sheds we sometimes miss the extra inches of headroom that an apex would bring, but not in this case. The ridge height is 2.06m and the eaves height is 1.80m which are both above average proportions for a shed with this size footprint. The overall width is 2.25m and the overall depth is 1.52m, which also equates to the minimal area needed for the base. It’s in the cladding that this shed differs radically from many other metal sheds we review. It is fabricated from what the manufacturer’s refer to as ‘super strength steel’. The result of this is that while the components are lightweight it creates a very strong and stable building once the assembly is completed. In fact, this shed has been tested to withstand winds of at least 90 miles per hour, which is very welcome news if you live in an exposed area. Another unique feature of the cladding is in the way it fits together. Absco use their own patented SNAPTiTE assembly system. We really liked this system, as it means that all of the cladding simply snaps into place among an upper and lower channel. You may find it a little fiddly at first, but once you’ve got used to the technique it can greatly speed up the assembly process. 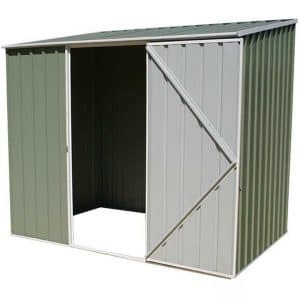 As with all metal sheds we review, there is no flooring supplied. Instead it has to be screwed down into a pre-existing level area, preferably made of concrete, and we were pleased to see that an anchor kit is included as standard for this purpose. 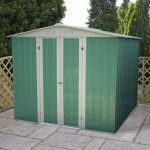 The feature that we appreciated most of all with this shed is its long 20 year warranty against perforation damage that has been caused by rust. 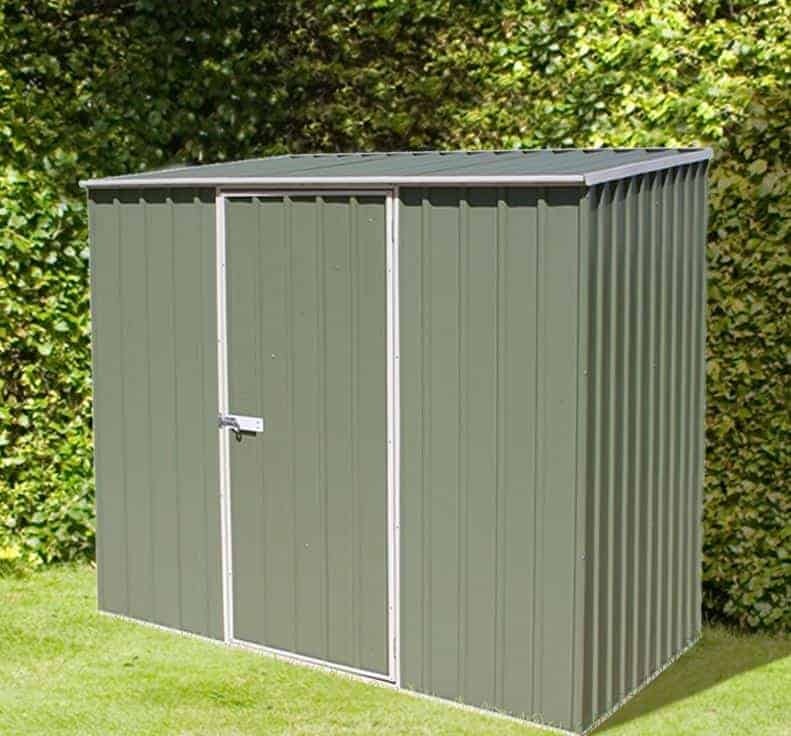 Not only is that twice as long as the cover on many of the metal sheds we review, it acts as reassurance for the customer and an indicator of how highly Absco rate the weather defences of their shed. There is, of course, no treatment required as it comes painted inside and out. We liked the fact that this single hinged door is strong and fully braced, as it forms the only potential entrance point to the shed. The height and width were also impressive, as the entranceway has a little under six foot of headroom and opens to a width of 0.75m, which is almost as wide as some double doors we see. There are no windows in this shed, which is standard for this kind of garden structure. We would, however, have liked to see the option to add a side window or a skylight, as this, coupled with the generous dimensions, would have meant that it was a shed that people would enjoy spending time in or that could even be used as a little workshop. As noted, the strong door, window free design which effectively stops passers by from seeing if anything of value is stored inside, and the strong rugged looks all help to increase the inherent security of this shed. The door contains a pad bolt which can be used to keep it shut, but unfortunately while it is holed and ready for a padlock, no such padlock is included as standard. We would have liked to see more optional extras available at the point of purchase. A set of racking, for example could enhance the versatility and storage potential of the shed. They can, however, be sourced separately and can be an inexpensive addition, as can a padlock which we would strongly recommend is bought, whether valuable items are being stored inside or not. The use of superior quality steel really shines through, and although it’s still relatively lightweight in its flat pack form it is very sturdy when constructed. A 20 year warranty is a good indication of how long the components of this shed will last, so there’s no need to worry about the appearance of rust. 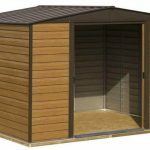 Even though this shed has a relatively shallow depth, this is more than compensated for by the accommodating width and height. We often find that metal sheds of this size can take a long time to put together, but the unique SNAPTiTE system speeds up the process considerably. You’ll need to read the instructions on how to use the assembly system carefully, but then you and a friend can expect to take between four and six hours on installation. 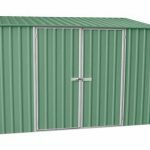 This isn’t the least expensive metal shed of this size that we’ve reviewed but thanks to its inherent strength, ease of assembly, and long warranty we feel it represents good value for money. Final Thoughts: If you’re not familiar with the Absco name, don’t worry. They’ve been making sheds in Brisbane, Australia for over 25 years and have a great reputation. 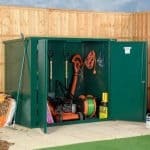 That’s why we’re pleased to see some of their space saving metal sheds now available over here. 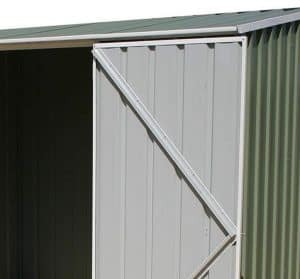 This is a classic example of their philosophy, with lightweight metal of the highest quality coming together to form a very strong shed which is resistant to both wind and rain. We also liked its taller than average dimensions, meaning that you’ll have no problem storing tall objects inside such as a strimmer, rake or garden hoe. 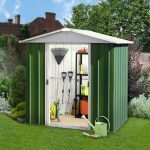 If you want to see the best absco sheds currently on sale in the UK why not check out the WhatShed best absco shed league table.